Lydia Lopokova, whom Keynes married in 1925, had appeared in London with Diaghilev's Ballets Russes in 1918, when Keynes was not impressed, commenting 'She's a rotten dancer  she has such a stiff bottom' (Skidelsky, op. cit., p. 93). But when, towards the end of 1921, he saw her again in other roles for Diaghilev, including the princess in The Sleeping Beauty, he fell deeply in love with her, but before they could marry her marriage to Diaghilev's former business manager Randolfo Barocchi had to be annulled. She later danced in productions of the Camargo Society, for which Roberts designed a backcloth. The double portrait may have been commissioned in 1930, but was paid for (£500) on 4 July 1932. Roberts had written to Keynes on 25 June 1932 for permission to include it in the LAA exhibition which opened on 29 June: 'I had told Davidson . . . I thought it would be available. As however there is still some more to be done to the head of your wife she may not wish to have the canvas shown until everything is finished'  Cambridge 1983 catalogue.
' . 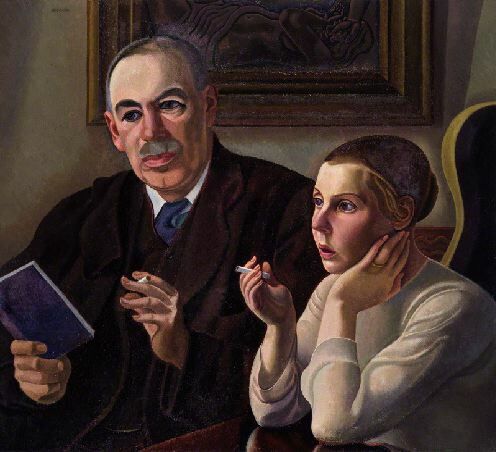 . . the sedate and compact portrait of "Mr. and Mrs. J. M. Keynes", into the linear and chromatic arrangement of which Mr. William Roberts seems to have poured all his science and love of harmonious organisation and fundamental solidity. As a pictorial composition it has the dignified countenance of an old master; as a portrait, in spite of the very perfect rendering of the sitters' features, it is deficient in human characterisation. The expressionless eyes with their empty, fixed, look, the unlit cigarettes held between exaggeratedly stylised liana-like fingers  (has Mr. Roberts lately been closely looking at Uccello?)  contribute to the solidarity of the composition, but also give the sitters the appearance of lifeless, mechanical dolls. Still, it is a fine piece of painting and one of the most consistent and accomplished works Mr. Roberts has ever produced'  P. G. Konody, 'Art and Artists: The London Artists' Association', The Observer, 17 July 1932.